By Chris Williams: Manny Pacquiao isn’t giving Conor McGregor much of a chance of beating Floyd Mayweather Jr. in their fight in Las Vegas, Nevada on August 26, on Showtime PPV. Pacquiao doubts that McGregor will land one good punch during the entire fight on Mayweather. 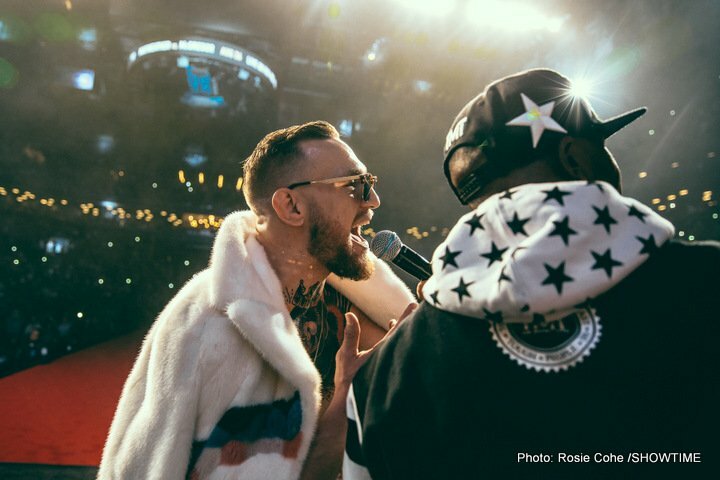 Initially, Pacquiao gave the 29-year-old McGregor no chance of beating Mayweather. But he then decided that if McGregor brawls with Floyd, he might have a puncher’s chance if he lands one big lucky punch. It’s not going to be easy for McGregor to land that big shot. Pacquiao should know. He was whipped by Mayweather in 2015 in losing a one-sided 12 round decision in their Fight of the Century. However, Pacquiao came off like a sore loser at the fight in saying he thought he had won the fight. Pacquiao further revealed to the news media that he had an injured shoulder. Mayweather was not happy to hear Pacquiao not giving him credit, and making excuses for his loss. “McGregor is of that school. Maybe he’ll get lucky,” said Pacqiuiao via skysports.com. “McGregor has no chance in this fight. The guys who caught him and rumbled did best. There is no way he will be able to land a meaningful punch on Floyd. How could he? He (McGregor) has no professional experience in boxing,” said Pacquiao. The guys that gave Mayweather the most trouble in his career were Jose Luis Castillo, Marcos Maidana, and Miguel Cotto. That’s just 3 fighters. Saul Canelo Alvarez would have given Mayweather problems if he had the sense enough to know that he need to use his size advantage to take the fight to Mayweather and brawl. Canelo didn’t want to brawl though. Canelo had become spoiled, as in his previous fight against Austin Trout in April 2013, Canelo had boxed him most of the fight using the Mayweather shoulder roll. Canelo thought he could do the same thing against Mayweather, but he thought wrong. Mayweather ended up making Canelo look bad in defeating him. There’s a saying, ‘Don’t box with a boxer.’ Somehow, Canelo and his so-called expert trainers failed to realize that. Instead of Canelo using his size and what got him to that point, he fought Mayweather’s fight and ended up losing a 12-round majority decision. McGregor seems to think his experience in the UFC counts for experience in boxing. He believes he can do the same thing against Floyd that he’s been doing in the UFC against the wrestler type guys he’s been padding his record with. This is going to end badly for McGregor. He doesn’t have the boxing skills of the brawlers that have given Mayweather a good test in the past. I’m talking about Marcos Maidana, Castillo and Cotto. Those fighters were excellent brawlers with good basic boxing skills. McGregor is just a UFC fighter without the needed experience to give Mayweather a run for his money. An experienced fighter like Errol Spence would give Mayweather problems if he fought him on August 26, because he would push a fast pace and take advantage of the ring rust that might be there due to his 2 years out of the ring.